The holidays are behind us and we’re looking onward to 2015, a year of success, happiness and health. Rather than place unrealistic expectations on ourselves when it comes to our weight, why not choose a few simply steps towards a healthier lifestyle that everyone can do? This year Burnbrae Farms is sharing healthy, and tasty, smoothie recipes that are easy for everyone to make whether you’re short on time rushing to work, a mid-day pick-me-up or a power boost before a good workout. 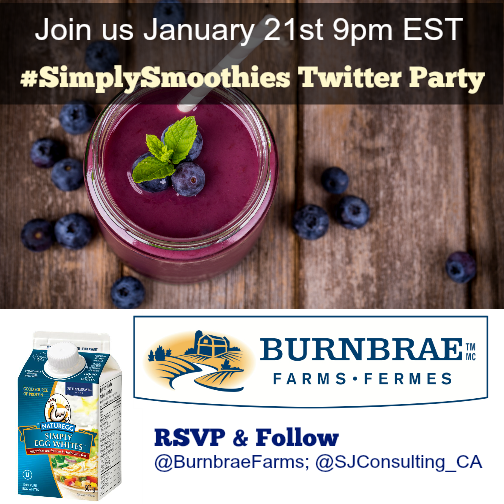 Join us January 21st at 9 pm EST for the #SimplySmoothies Twitter party for a fun chat discussing health, recipes and a few prizes for a few of you to get started with a year of Smoothie ideas. Burnbrae Farms Naturegg Simply Egg Whites is made from 100% pure egg whites. Egg whites have absolutely no fat or cholesterol in them, however, they are packed with high quality protein and a source of 3 vitamins and minerals. Naturegg Simply Egg Whites are ideal for nutritious smoothies and are pasteurized which makes them completely safe to use raw in a beverages for a smoothie power punch. 5 x Kitchenaid 2 speed blender (variety of colours) valued at $69.99 + a cutting board & Burnbrae Farms coupons. 5 x Hamilton Beach single serve blender valued at $21.99 + a cutting board & Burnbrae Farms coupons. 2x FitBits valued at $99.99 + a cutting board & Burnbrae Farms coupons. RSVP Below by adding your Twitter name (ie. @SJConsulting_CA) in the URL field and your Twitter link (ie. https://twitter.com/SJConsulting_CA)) in the Name field.